Are you the next America Ninja Warrior? 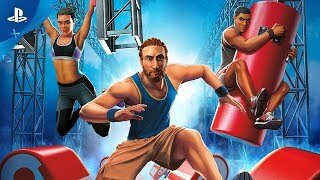 Compete and achieve Total Victory with the action-packed obstacle-course competition game! Take on classic obstacles such as the Salmon Ladder, Warped Wall, Log Grip and more! © 2019 USA Network Media Productions, LLC. “American Ninja Warrior” is a Trademark of Tokyo Broadcasting System Television, Inc. All rights are reserved.